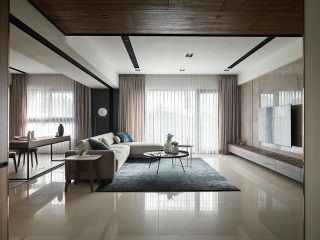 Entering the abode, polished stainless wall decor attracts attention, not only because of its glow, but also of a contrast with backdrops of ink-wash cloud textured in deep color hue, which is unintentionally coherent to natural veins from marble wall, bringing misty and airy sensation, composed and profound. Orient vibes linger in this contemporary interior space. Drift to open-concept area, dim lights blur through grey transparent glass, propelling to progressive interaction with spaces and materials. Lens flares illuminate metallic glows, and give a warm tone to salvaged-wood grains. Sunlight sways through shutter blinds, flickering in hazy space, culminating with calm yet fascinating ambiance.